Once upon a time, there was a company named Whoindaland, which had developed a great online reputation and was doing very well. Everything was good in the land. But then one day, someone famous decided they didn’t like Whoindaland’s services and sued them. A newspaper picked up the story and ran with it, and the company was suddenly in an online reputation management (ORM) crisis. The company, in an attempt to make sure their good name didn’t get ruined, responded to the newspaper story with one of their own. “We were cleared of this issue with this famous person, and you should just ignore that it ever happened,” their publicity said. But no one listed. Even though the lawsuit was dropped and Whoindaland was freed, that online story still hung around, like the odor of bad meat on a hot day. The company tried valiantly to get rid of the story, to bury it with press releases, and all it did was bring it back up to the top. Bobbing for apples gone wrong. Three years later, the company is still suffering under the cloud of this immortal online story that just won’t stop ruining their online reputation. Sadly, it’s a true story, with names changed (or left out complete) to protect the innocent. Even more sadly, Whoindaland isn’t the first–and won’t be the last–company dealing with an ORM problem just like this. However, this kind of reaction is not going to produce the results you’re looking for. Even though it’s three years later for this company, they’re still sending out press releases that talk about being exonerated and how the lawsuit was dropped. True, it’s in an attempt to out press the competition, but it’s the wrong way to go about it. So, what could Whoindaland have done? What should you do, if you find yourself in a similar position? What steps can you take to protect your online reputation during a crisis? 1. Send out a press response immediately. And then stop. Once the crisis has happened, there’s not much you can do to fight off the negative press. Your first instinct might be to post as much on the problem as possible, in an attempt to get your side of the story out. However, the more you post about it, the bigger the problem becomes–you’re basically creating your own negative press. Individuals come across your post that says, “We didn’t do whot those people said we did.” They immediately wonder, “Well, what did those people say you did?” They search out the issue, which brings more interest, and usually end up with the original article without your spin on it. Rather than inundate the web with “your side,” KISS the problem goodbye. That is, Keep It Simple, Stupid. Take your time, create a top-notch “our side” press piece, and publish it. Put it on the press section on your site and then, despite what you feel like doing, let it go. You’ve had your say. Anything else will only bring more attention. 2. Put out the brushfires calmly. Most ORM issues gain their fair share of negative commenters, especially on social media. This is where #1 is exempt. Take the time to respond to those naysayers, but make sure your comments are always calm, and always point back to the statement created in #1. We can’t stress enough that you and your marketing team keep a level head, not matter what kind of responses you get. However, once you’ve responded to the negative poster, stop. Don’t let them draw you into a never-ending argument. 3. Work on setting up/filling out and claiming accounts. You aren’t busy scrambling up long-winded replies, so what are you doing? You can’t just twiddle your thumbs, right? Right. Instead, take that nervous energy and turn it into productivity. Take the time to build up your business and social accounts. A few social accounts won’t make a difference, but major players definitely will. If you don’t have a Facebook, get one. Fill that profile out to the top nines. Twitter, LinkedIn, Google+, Google Business, About Me, Wikipedia–try KnowEm on for size. Resist the urge to mention the crisis or link to it. You don’t want Google thinking it’s important by pointing a ton of links to it. Search your company name in the search engines. If there are places that show up with company information and allow you to join to edit said information, jump on it. Think of it, not as burying a story, but as filling up the top ten with YOU. 4. Work on building up your blog. Industry news, company news, helpful product /service information… there are plenty of potential angles to build up any blog. Not only is this great for building up your reputation and keeping a negative story down, it’s also great for your SEO. Plus, it gives positive information for searchers to find instead of the negative results you want to keep buried. 5. Build up your reputation on other sites. Industry sites, similar blogs, even some competitors will help you to build up your reputation by allowing you to put content on their site. Don’t waste these opportunities with rehashed blog posts, though. Make your content shine. It makes the host site–and you–look great! Will the above steps absolutely bury your story and have you come out smelling like roses? Of course not; some mishaps are so bad they never really die. However, for most companies, it’s possible to recover. 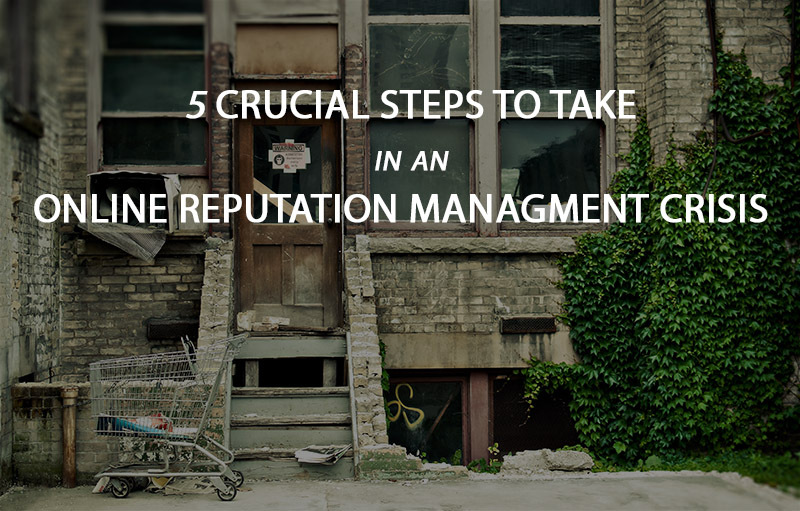 The number one way to get through an online reputation management crisis is to have a management plan in place before anything happens. Make sure your team, from the top, down, knows what to do and what to say. Make sure your brand values and message are firmly in place. Make sure that plan is followed to the T.
ORM crises happen, but you don’t have to watch the ship burn. Having a crisis management plan in place and following the five steps above can go a long way in putting out your ORM problem.